I have two baby minilops. 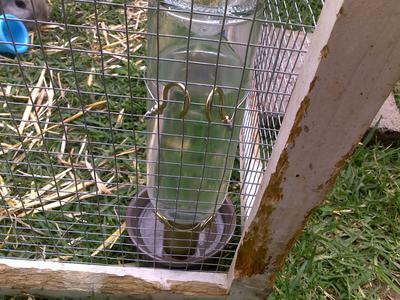 I am planning a weekend trip away soon, but gravity feeders / waterers are so expensive, so I made my own. It also reduces waste and mess. 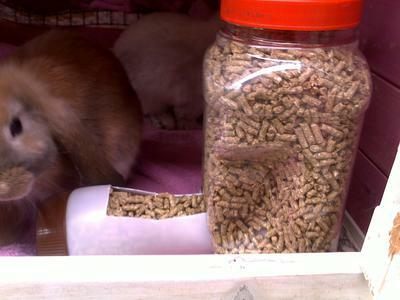 The gravity feeder was made using a large plastic olive jar with a screw top lid and a plastic coffee jar with a circular hole cut out of one end and a small rectangular cut out the side. The coffee jar is a soft, fairly pliable plastic, so after making a hole close to the base of the olive jar just a little smaller than the base of the coffee jar, I was able to manipulate it such that it fit snug. 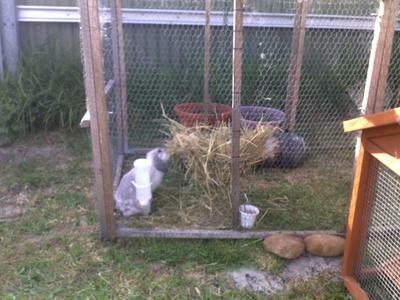 A hanging planter makes a great hay storage unit too. The waterer was much easier. I got an old glass bottle with a lid, made two supports using small screw type cup hooks. I wrapped wire around one hook, measured it on the neck of the bottle and then wrapped wire around the hook on the other end. I did the same for the base of the bottle. 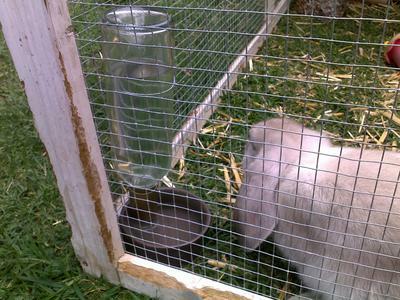 Fit the supports to your cage such that the neck of the bottle sits about half way into a small ceramic bowl. Fill the bottle with water. Screw on the lid, fit it to the supports and then unscrew the lid of the bottle and let the water flow. The water level will remain the same.